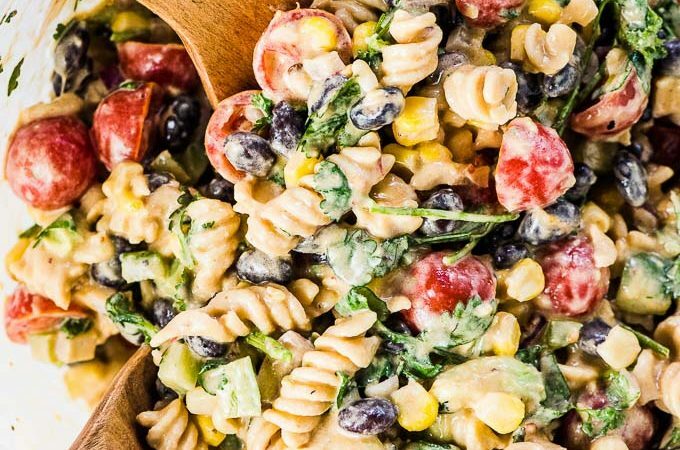 This Mexican Pasta Salad recipe is the best ever. 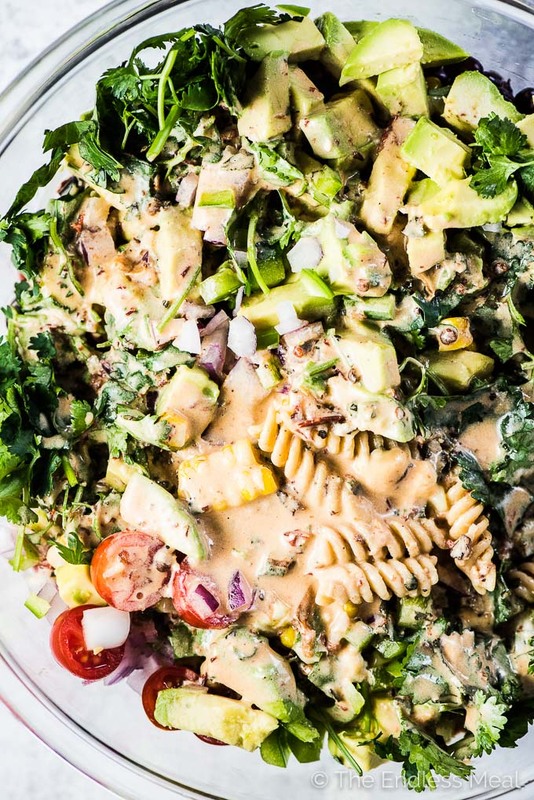 It's loaded with creamy avocados, sweet corn, black beans, crunchy green peppers and red onions, and my favorite healthy pasta, Chickapea Pasta. Then it's smothered in a creamy (and easily vegan!) chipotle lime dressing. You will LOVE it! Warning: I'm even more excited to share this recipe with you than usual. Here's the thing, when I set out to make this Mexican Pasta Salad I did it as a bit of a challenge. I don't normally like pasta salad (I know, I'm a weirdo) so I wanted to make one that I really liked. I figured that if I could win over the toughest critic (me!) then it must be a really amazing pasta salad. I also decided that it had to be an easily be made into a vegan pasta salad. Making the best pasta salad recipe ever and expecting it to be easily vegan adaptable is no small challenge! After the first time I made this Mexican Pasta Salad, here's what happened: I went back for three (3!!!) servings. I've never in my life taken even a second serving so this was groundbreaking. It is LOADED with all the good things. This is not a pasta salad that is all pasta with some creamy dressing. It is the perfect mix of contrasting flavors and textures and interesting with every bite. Creamy avocados and black beans, crunchy jalapeños and green peppers, sweet corn and cherry tomatoes, and delicious cilantro. The chipotle lime dressing. You guys, it's so good. It's creamy with a touch of smoky heat and a tang of lime. It's delicious. 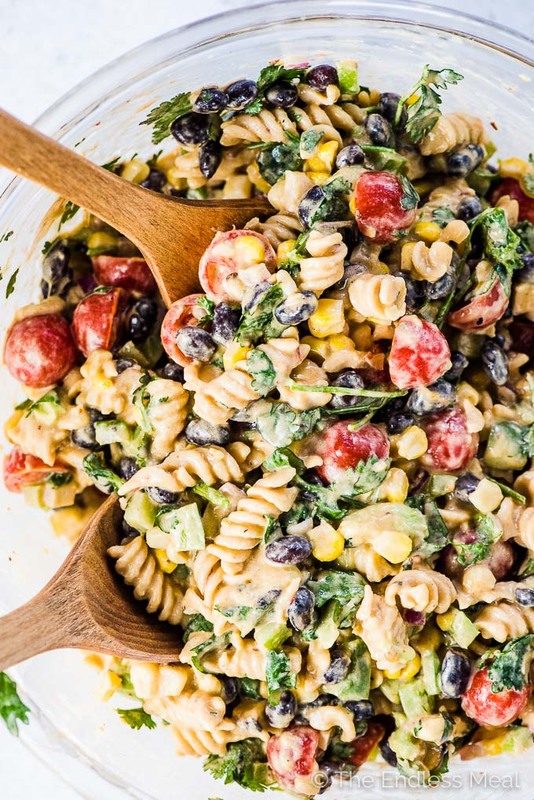 There is so much going on in this pasta salad that you would easily eat this as dinner. And the leftovers keep very well. Think healthy meal prep work/ school lunches! It's made with my favorite healthy pasta, Chickapea Pasta. You would NEVER know you're not eating regular pasta. I not only need to gush over this southwest pasta salad, I need to tell you how much I love Chickapea Pasta. It's seriously my favorite healthy pasta. It is made with chickpeas and lentils and that's it. There is no added sugars and nothing artificial. This is 2 ingredient magic pasta. Because of those chickpeas and lentils, Chickapea is a high-protein pasta. I'm talking about 27 grams of healthy, plant-based protein per serving! 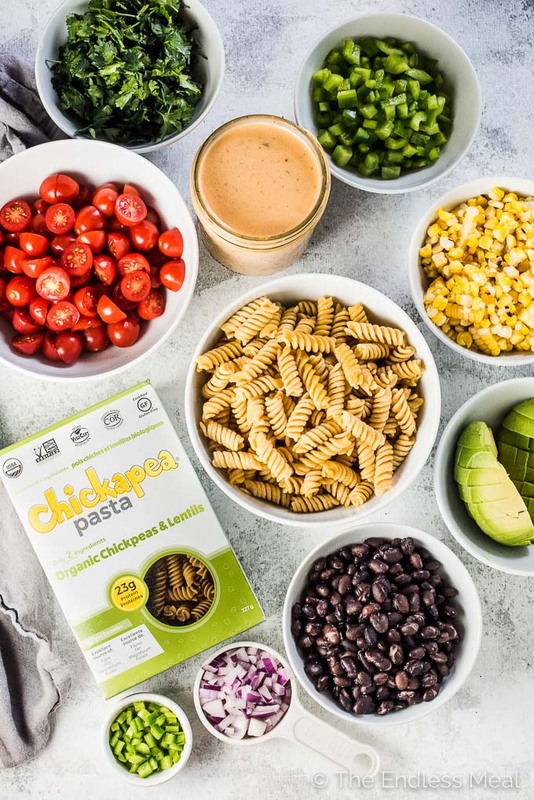 Chickapea Pasta is gluten-free, vegan, kosher, organic, and non-GMO. It's amazing! Saving the best for last … Chickapea tastes great. It doesn't taste like gluten-free pasta, it tastes like real, whole-wheat pasta. It tastes just like the stuff you crave only it's healthy for you. 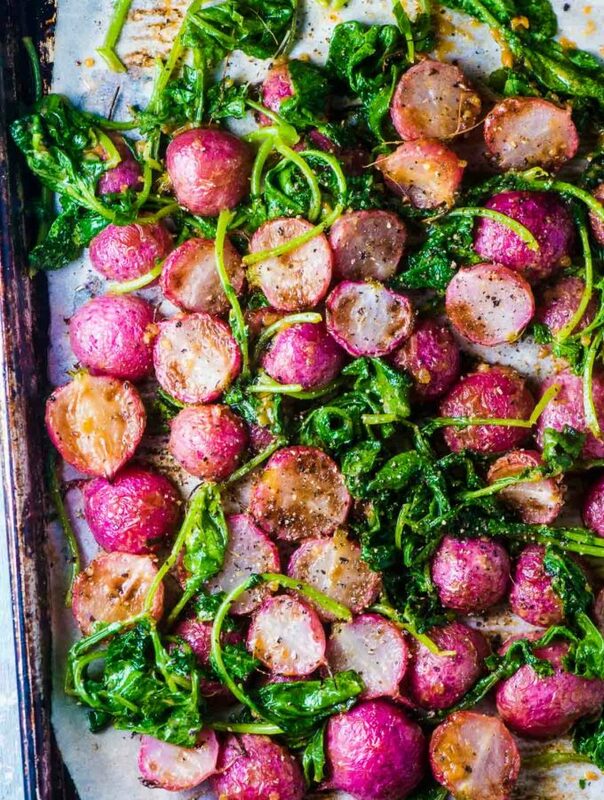 A true family favorite turned superfood! 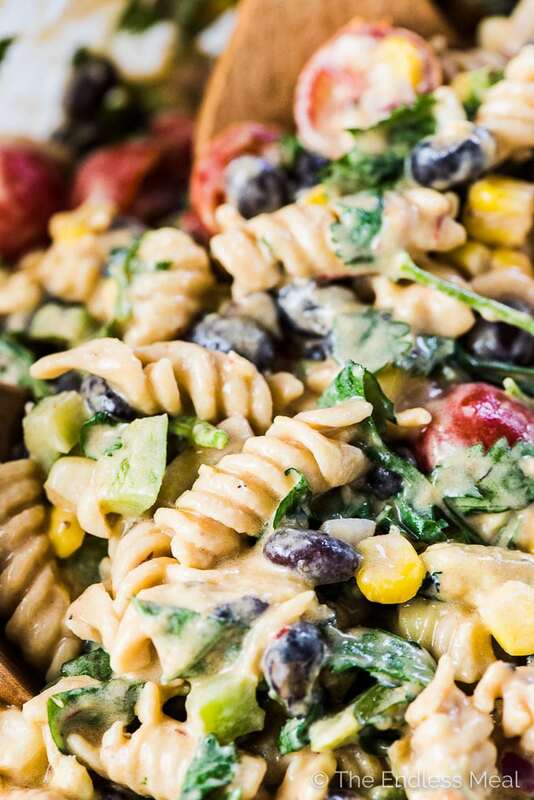 When you make this southwest pasta salad with Chickapea Pasta, you'll be amazed. You truly cannot tell that it's not made with regular pasta. Any pasta salad recipe is only as good as what it's tossed in and this Mexican Pasta Salad is no different. What I've made for us is the most delicious chipotle lime dressing. That spoonful of sauce up there is a magical, Mexican salad dressing. It's made with freshly squeezed lime juice, chipotle sauce, garlic, a little oregano, and thick Greek yogurt. To make this a vegan pasta salad, simply use your favorite vegan yogurt or vegan mayo. So easy! Note: if you try the dressing before you pour it over the pasta salad you'll think it's too salty. That's because the dressing needs to be salty enough to flavor all the pasta, tomatoes, beans, corn, and all the other good things in the salad. Once you pour it on and toss it, you'll see that it's perfect. Bring a large pot of salted water to a boil over high heat. Add the 2 cobs of corn and the Chickapea Pasta Spirals to the pot and cook for 7-9 minutes, or until the pasta is al dente. Remove the corn from the pot then drain the pasta with a colander and rinse it under cold running water. Cut the kernels from the cobs of corn. While the pasta is cooking, add all the Chipotle Lime Dressing ingredients to a 2-cup mason jar and shake to mix. Place the cooked pasta, corn, cherry tomatoes, black beans, red onion, cilantro, green pepper, avocado, and jalapenño in a large salad bowl. Pour the dressing over the top and toss to mix everything together. If you don't have a favorite vegan yogurt, you can substitute vegan mayonnaise for a richer pasta salad. The dressing will taste quite salty. This is ok as it is the salt for the entire pasta salad. would any veg oil be fine ? like canola or olive? I didn’t have enough tomatoes or pasta on hand, so I supplemented with minced carrot. I used more cilantro than called for because yum. I recommend a less than ripe avocado to withstand the dressing and tossing without becoming an unrecognizable mushy mess. I suspect you could get creative with the ingredients and use almost any combo of crunchy veggies. Radish would be great, just like they serve on Mexican street tacos! I used red lentil rotini, which worked great, especially because of the color. Using alternative pastas is a great idea because they hold up well to the saucing and tossing! I used slightly hot Anaheim pepper rather than bell, and I used a whole jalapeño. That is zesty!! Next time I will use a food processor to blend the chilis in sauce and strain the liquid into the dressing to intensify the flavor and texture. Measuring dressing ingredients into a mason jar was a pain, and I think whisking in a bowl would suffice. Overall a really delicious and genius recipe. I can’t wait to taste again tomorrow after the flavors have melded. I think serving at room temperature would be divine. Thanks so much for a wonderful recipe. I’m so happy you enjoyed the recipe! And good call on the hot pepper. Spicy is always better in my books! This looks amazing! 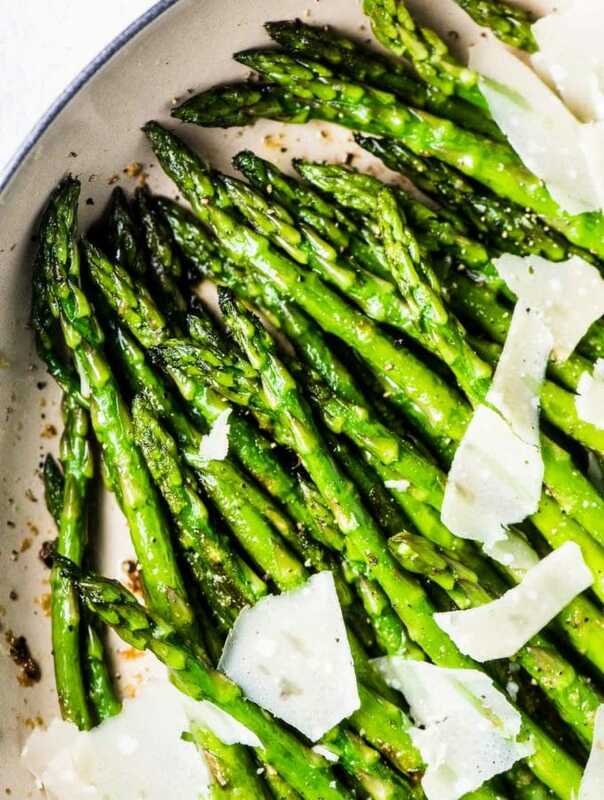 I’m going to try and make this recipe and see if it’s something that works for our summer parties at the lake house in Clear Lake, California. We typically serve around 100 people over the weekend, do you think this recipe is easy to scale for that many people? Hi! I must have pit in too much adobo sauce, my salad is way too spicy! Any suggestion on how to tame it? If you’re finding it too spicy you can add some extra yogurt or put in a scoop of mayonnaise. That should do it! You’re right this is the best pasta salad ever! I was skeptical about the chickapea pasta cause I’ve tried some gluten free pasta that I didn’t like but this one was just like you said it is. Making this again for a family bbq next weekend! Isn’t it great? I can’t get enough of it. Happy to hear you like it too!! It really is my favorite pasta salad recipe!! Chickapea really is the best pasta, isn’t it? I have no words Kristen! No words!! Just stupidly drooling over my keyboard right now! Then my job here is done! Enjoy!! Lovely recipe. How much cilantro please? I just made this, and I”m not sure it will last for 4-6 servings… It’s DELICIOUS!!! Thanks for sharing this gem! OH and our local IGA carries it!! Thanks for checking for me though! That’s so great to hear! Yaaa! Sounds amazing Kristen! Can you get the chickpea pasta in Vancouver, or do you order it online? Gotta try it! Both Amazon and well.ca are both great places to buy it online! Oh goodness. My belly is growling HARD over here. I am so in love with all of these ingredients! Everything is so fresh—and that dressing is *everything*. I love when you can indulge in a creamy dressing yet not feel guilty about it. Greek yogurt is magical. Beauty recipe! Awww thank you so much! Healthy recipes are my favorite, but they have to feel indulgent, too. IMO. So with you about Greek yogurt. I love it!! You totally killed it with this one Kristen! I’ve got a box of chickapea pasta sitting in my cupboard ready to go and this looks like the perfect thing! You should totally make this recipe with it! I promise you won’t be disappointed!! I am ALL about chipotle flavored anything, and this is no exception! Right? There’s no such thing as too much chipotle in my books! This looks so creamy and delicious, Kristen! Definitely on our must make summer menu! It’s been on repeat here all summer!! This pasta salad is right up my alley Kristen! I love Mexican flavors and Chickapea Pasta is so healthy that I love serving it to my family. I’ll definitely be making this! Mexican flavors are my fav! And I love that you love Chickapea Pasta, too. It’s also our family’s fav!! I’m not either but this one won me over!! This looks so yummy! Chickapea pasta makes it that much more filling! Love the flavors you’ve got going here, Kristen! Sharing! I love using Chickapea Pasta for the big boost of protein it gives every recipe. And it just tastes great! 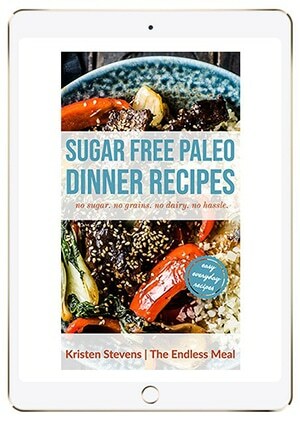 This looks fantastic, Kristen! I love the mix of veggies in here and the use of protein packed Chickapea pasta to bring them all together! 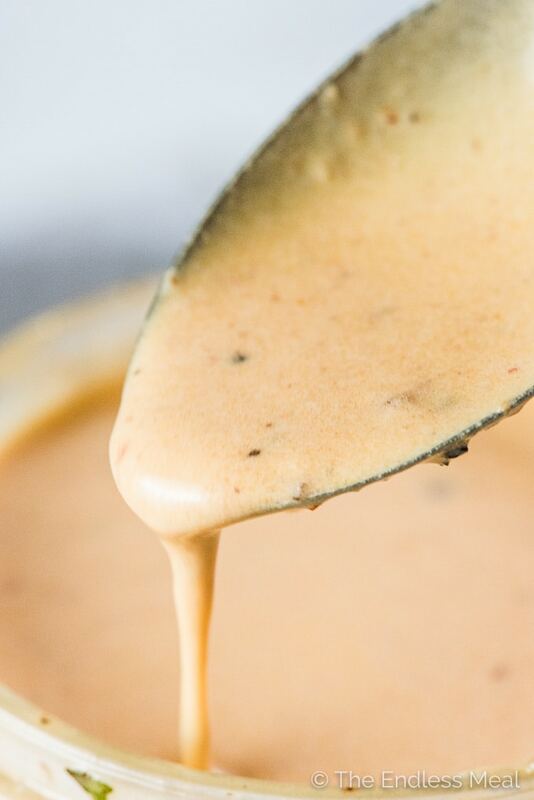 This Chipotle dressing is seriously addicting! Can’t wait to make this healthy salad, loaded with my favorite Chickapea pasta! YUMMY! I’m so happy to hear you like Chickapea Pasta, too! It’s our fav!! I love this creamy and healthy recipe, especially that you can make it vegan! So nice to have options, isn’t it?!! Everything I love in a summer meal! I also am not really a pasta salad fan — but put Chickapea and all of these other amazing things in the mix, and I am totally in! On the meal plan this week. I’m not usually either! I loved using Chickapea in this recipe because it turned a usually unhealthy dish into a totally healthy one! Oh wow, Kristen, this healthy pasta salad has got everything I love in a great dish. I’m a texture person and i need both creamy and crunchy – fantastic! These flavors! The contrasting flavors is what I really love about this recipe. There’s so much going on here!